Annual home price movement was a mixed bag across the Bay Area in February. Pacific Union’s Contra Costa County, East Bay, Mid-Peninsula, Sonoma County, and Sonoma Valley regions saw double-digit-percent price increases from February 2016. Year-over-year appreciation was flat in Napa County, rose by 2 percent in Marin County, and declined by 2 percent in Silicon Valley. San Francisco condominium and single-family-home prices moved in opposite directions, with the former rising by 10 percent year over year and the latter dipping by 8 percent. Click on the image accompanying each of our regions below for an expanded look at local real estate activity in February. The number of homes for sale hit a one-year high in Contra Costa County, as the months’ supply of inventory rose to 2.4. The median sales price was $1,170,000, up on both a monthly and annual basis. Homes sold in an average of 29 days, with buyers paying 99.2 percent of asking prices. East Bay real estate remains a white-hot commodity, as the median sales price broke seven figures for the second time in a year to end February at $1,050,000 — an annual gain of 20 percent. Perhaps motivated by price increases, more sellers put their homes on the market, and the months’ supply of inventory rose to a one-year high of 1.8. Multiple offers are still the norm in the East Bay, with sellers receiving an average of 113 percent of original prices in February. Homes sold in a speedy 20 days, substantially faster than in January. 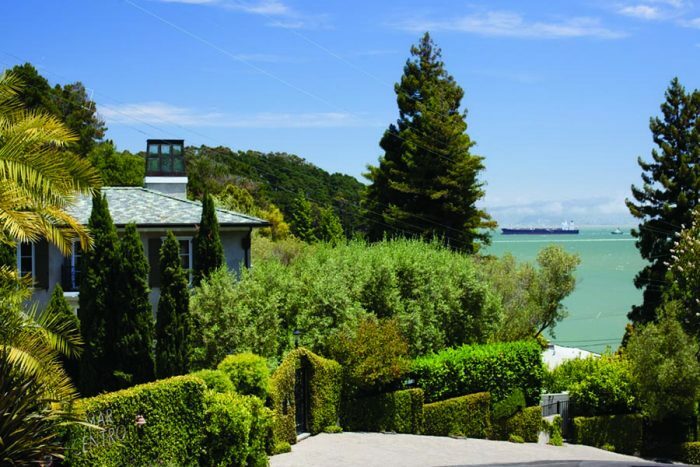 At $1,174,500, February’s median sales price in Marin County was not terribly different from the previous 12 months. Buyers had more properties to choose from than in December or January, as the months’ supply of inventory rose to 2.2. Homes sold in an average of 57 days for 99.4 percent of asking prices. Annual price appreciation was flat in Napa County, with the median sales price ending February at $657,000. The region had a 3.8 months’ supply of inventory, the highest level since last August. Homes took an average of 136 days to find a buyer, the slowest pace of sales in the past year. Buyers paid 93.1 percent of original prices, in line with numbers recorded over the previous five months. The median sales price for a single-family home in San Francisco was $1,276,000 in February, up slightly from January but down 8 percent year over year. There were significantly fewer properties on the market than in February 2016, with a 1.9 months’ supply. Premiums remained a fact of life in San Francisco, and sellers took in 110.6 percent of original prices in February. Homes sold in an average of 40 days, about a week slower than they did one year ago. The median sales price for a San Francisco condominium rose to $1,210,000 in February, a one-year high. After two months of getting slight discounts, buyers returned to paying premiums — an average of 101.3 percent of original prices. The pace of sales picked up from January, with units selling in an average of 39 days. The months’ supply of inventory was 2.4, down on both a monthly and yearly basis. For the first time in almost a year, homes in our Silicon Valley region fetched premiums in February, selling for an average of 102.7 percent of original prices. Homes left the market in an average of 26 days, twice as quickly as in January. The median sales price was $2,650,000, with the region ending February with a 2.2 months’ supply of homes. The median sales price in Pacific Union’s Mid-Peninsula subregion climbed to a yearly high in February: $1,925,000. The months’ supply of inventory fell to 1.3, less than half of the level recorded one year earlier. Homes sold in a brisk 18 days, on average, for 105.1 percent of asking prices. Sonoma County‘s median sales price ended February at $599,000, nearly matching its one-year high. Properties took an average of 79 days to find a buyer, identical to the pace of sales in February 2016. The months’ supply of inventory fell to 1.9, and buyers paid 95.4 percent of original prices. February was an opportune time to buy a home in our Sonoma Valley region, with properties selling for 90.3 percent of asking prices — the biggest discount recorded over the past year. The median sales price was $697,500, down sharply from December and January but up 10 percent from February 2016. Homes took an average of 102 days to leave the market, almost a month longer than they did one year ago. The months’ supply of inventory fell to 2.4, the lowest since August. The bounty of snow that has blanketed the Lake Tahoe region this winter helped push the median single-family-home sales price to a one-year high of $740,000 in February. Homes sold in an average of 93 days, more than a month faster than they did in February 2016. The months’ supply of inventory rose to 6.4, and buyers paid 92.9 percent of original prices. Like their single-family-home counterparts, condominium prices in the Lake Tahoe region climbed to a yearly high in February: $453,500. Although there are still plenty of units on the market, the 7.0 months’ supply of inventory was down substantially from one year earlier. Condominiums in the region sold in an average of 106 days for 90.6 percent of asking prices.